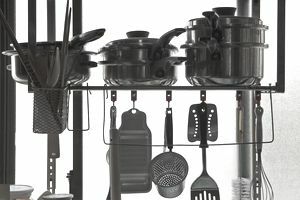 Over the years a kitchen or household can become cluttered with many utensils, gadgets, and gifted items that don't get used often or are unneeded altogether. Instead of throwing these things away, you can sell them for cash on eBay. You might think that your own items would never sell, but in keeping with the "one man's trash is another man's treasure" motto, you'll never know what sells until you try listing it on eBay. You might be very pleasantly surprised. According to a study from research firm NPD, the average American family has about $7,000 worth of unused stuff that can be sold online. That's a lot of money lying around in closets, drawers, basements, and kitchens. You might be thinking that decorative collectibles, jewelry, or expensive handbags are the only things worth selling on eBay. However, if you take some time and comb your house top to bottom, you will find all sorts of items that have value in the eBay marketplace—items that may just seem like worthless junk to the average person. Most people have hundreds of profitable items hiding in plain sight right in their homes. You can sell almost anything on eBay, but you will need to understand how to determine what an item is worth in the eBay marketplace. start by checking out this video showing how to figure out how much an item can sell for on eBay. Once you start selling on eBay, you just need to keep your eyes open and your antennas up—cash is hiding right in your home and you just don’t realize it. Keep in mind that collectible, rare, and vintage items will usually bring a higher price, but don’t ignore items that appear ordinary and utilitarian. There is a huge movement right now towards repurposing broken or obsolete items as a way to recycle. If you are a Pinterest user, think of the items you have seen made out of all kinds of old junk. Something may look obsolete or unusable to you, but it could be exactly what a crafter or DIY person is looking for, and they will pay you good money for these seemingly worthless items. Everybody has cabinets and drawers full of items they don’t use in their kitchen. Many women have friends who have held a Pampered Chef party. You may have been invited, and you felt obligated to buy something. If you did buy something, maybe you only used it once or not at all. The eBay site shows over 5,000 items with Pampered Chef in the title, in used condition, sold in the last 30 days. The Pampered Chef chopper, stoneware, cookie molds, batter bowls, and cookware are great and consistent sellers. Wilton cake pans are highly collectible. Many were limited editions and, believe it or not, collectors will pay hundreds of dollars for a rare pan. Disney characters do especially well. Do the research and determine if your pans are worth more individually or as a lot or set. The Disney Minnie Mouse, Star Wars R2D2, and DC Comics characters can sell for over $50 each in used condition. Dutch ovens are great sellers. They are heavy but easy to ship and won’t break. These can often sell for over $100. In a big family, the kitchen may accumulate several of these over time. When people downsize, they sell brands like Club Aluminum, Calphalon, and Farberware Dutch ovens for a nice price. And if you only have the lid, you can sell it by itself since some buyers just need to replace their own missing Dutch oven lid. Ok, so most people don’t have $300 mugs stashed away in their kitchen cabinets, but you probably have some junk drawers where a bunch of random things like watches, pocket knives, lighters, thimbles, pens, keys, key chains, broken jewelry, coins, and other odds and ends have accumulated over the years. Now is the time to turn that junk into cash! In fact, people will actually buy “junk drawer lots” on eBay. You may not have time to work through all the contents of a junk drawer, but collectors will, hoping to find a few valuable "gems." When you have some spare time, log on to eBay and start looking up some items from your kitchen that you don't use, want, or need anymore. You will be shocked at what some items, or even parts of appliances, sell for. Before listing any items, though, especially large or heavy items, make sure you think through how to ship any items you list. Making Sense of eBay Auctions With a "Reserve Price"
Find out If eBay Your Account Is in Jeopardy - Check Your Dashboard!